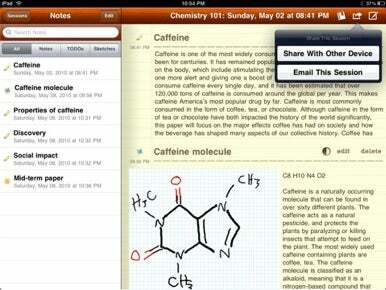 Taking class notes is going digital in a big way with the iPad, and a major CourseNotes upgrade aims to make the process more social and flexible. New in version 2.0 of this note-taking, sketching, and to-do-organizing iPad app is the ability to export notes for sharing with friends and classmates on Facebook, or with other CourseNotes users. A new in-app store with premium note templates, study sheets, and other content should also help students take better notes. These new features are in addition to CourseNotes’s existing tools that let you organize notes by subject and note sessions; draw and sketch notes; track assignments and to-do lists; share notes via e-mail; and store a glossary of terms and definitions for each subject. CourseNotes 2.0 is available now for $5 in the App Store and requires an iPad running iOS 3.2 or later.